Over a year ago, I wrote about Andy Ihnatko filming himself as he walked. It didn't look like he was holding the camera at arms length, yet he was able to keep his face in frame. It was a neat effect. He described how he was using a modified tripod. I was reminded of his device when I saw this tripod on the web today. The QuikPod Handheld Convertible Tripod is built to do the same thing that Andy did for $17 (Amazon price). Ihnatko says he built his from parts of other tripods for about $5. 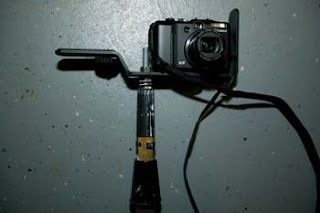 While surfing Amazon I saw another similar product called the QuickPod DSLR Handheld Convertible Tripod. 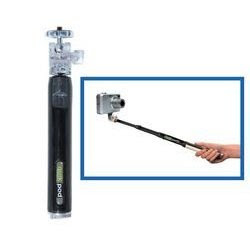 It also works as a monopod and includes an angle mirror to help you see what you are shooting. This one will set you back $49.95 (Amazon price). Both are made by the same company, QuickPod. Do a search on Amazon for tripods, monopods and/or camera extenders and you will see a few more of these setups. I had the idea that you could use the garage built camera mount that I linked to in a previous post, and hook it to a painters pole. As I also suspected, my idea was not original and after a little searching found several web posts about doing this very thing. Here is a shot of a rig shown at Photography for Real Estate. The author uses a bracket to mount his camera to a pole which lets him take some shots of his houses with a different perspective. Lots of plans out there for some cool do-it-yourself projects. Don't think I will be buying the Quickpod model just yet. At least not until I bloody my thumb on a few home made attempts first.